SwiFTP can be downloaded freely from the market. 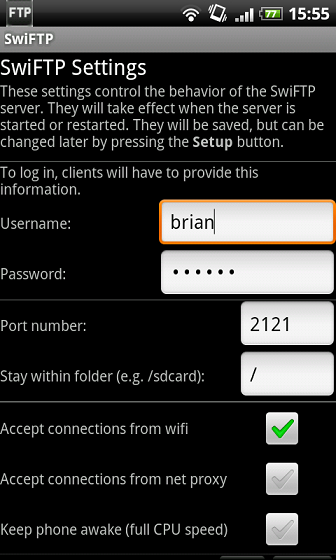 It is a small application which allows your phone to act as an FTP server. It can also allow you to access your phone from a remote network via a proxy, but that will not be covered in this tutorial. As it states in the market description, any client (such as FileZilla or Cyberduck) can be used, but this tutorial will be using functionality built right into Windows. After installation, open SwiFTP. Tap the Setup button, which will bring you to the screen above. Fill in the empty fields with the details you would like to use to connect to your phone from the computer. The port number can be left as the default 2121. Now return to the main screen and hit Start. A string of numbers in the form ftp://192.168.X.Y:Z/ will appear next to the Wifi URL label. This is the address of your phone on the local network, followed by the port that the FTP server has open for connections. Your phone is now ready for connection to your computer. Open up My Computer and click Map network drive. 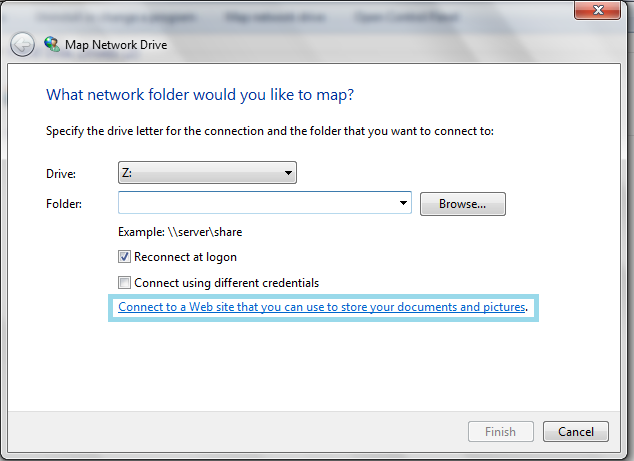 A window will now pop up prompting you to select a drive letter and a folder. Ignore this and click the link near the bottom for a Web drive. Enter the Wifi URL from Step 3, and click Next. Now enter the user name that you specified in Step 2. When you mount your phone as a network drive later you will be prompted for the password which you can store so as to not have to enter it every time. Final step. Name your phone as it will appear under Network Drives in My Computer. If all went well, then you should now have access to your phone’s file storage over WiFi. FTP transfers are not as fast as USB, but it saves you having to turn off your phone to extract the microSD card or spend a few minutes trying to track down your cable. All you have to remember is to start the server on SwiFTP before connecting to the drive on your computer, otherwise it won’t be able to find it. NOTES / WORDS OF CAUTION : The connection established by this tutorial is not encrypted. Exercise caution when transferring files of a sensitive nature. It also requires that your phone have a static IP, otherwise your phone’s server address may change the next time you reconnect to your wireless network. To set up a static IP address, you will need to get your MAC address (Menu > Settings > Wireless & Networks > Wi-Fi Settings > Menu > Advanced), and then give that MAC a static IP on your WiFi router.